I mentioned before that I have pinned a few dozen recipes from Cassie Craves. This week I will prove that I was not fibbing! Cassie has so many great recipes to try out. I tried the Pretty Damn Amazing Biscuits with Sausage Gravy first, next up are these Cowboy Burgers with Caramelized A1 Onions. As you can see I actually made sliders, not burgers. I was about to get about 8 slider patties from one pound of ground beef. My only other change was I used only one onion for the Caramelized A1 Onions, but I kept the butter and 1 Tbsp. of A1 Sauce amounts the same since I wanted them to have a strong flavor. Enjoy! 1. Season burgers on both sides with hamburger seasoning. Heat grill or large skillet over medium heat. Cook burgers 5 minutes on each side or until cooked through. 2. Meanwhile, heat butter in a large non-stick skillet over medium-high heat. Add onions; cook and stir 10 minutes or until golden brown, stirring frequently. Stir in steak sauce. 3. 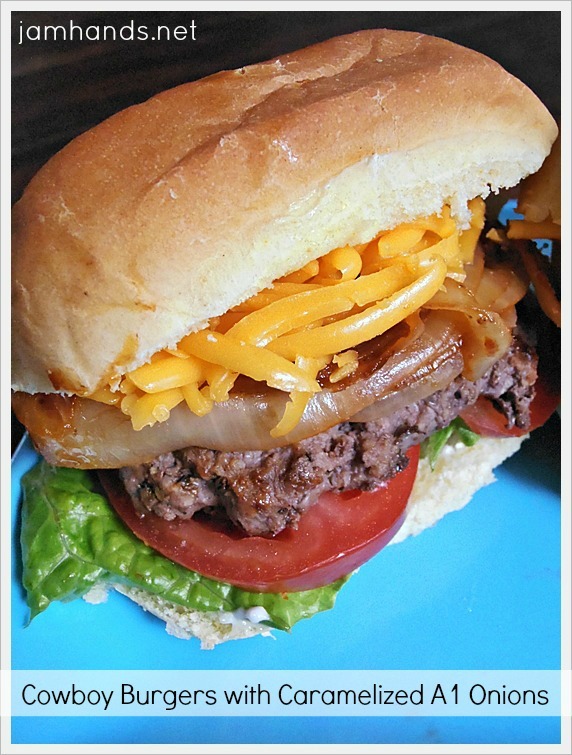 Fill buns with tomatoes, burgers, cheese, onion mixture, and banana peppers. Recipe from Cassie Craves. Sharing this recipe at the following fun link parties. Gosh, these burgers look mouth watering delicious! 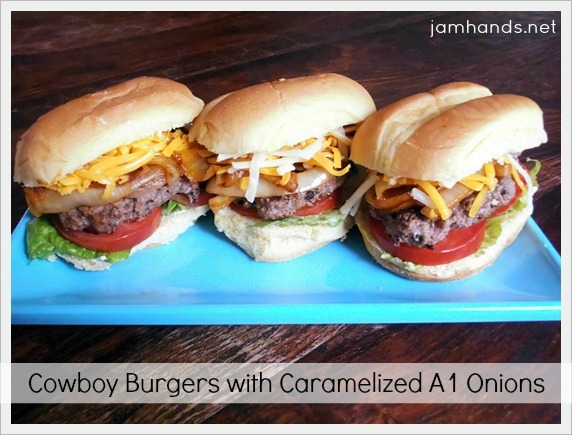 I LOVE caramelized onions on my burgers and the addition of A.1. sauce is ingenious. I need to remember this recipe when the weather gets warm enough here to grill again! YUM!! Makes me hungry and I just ate a while ago! These do sound good and your pictures make them even better! We're having a party at Tumbleweed Contessa - What'd You Do This Weekend? and I'd love it if your brought these over to share. Take a look around at what creative bloggers have shared.